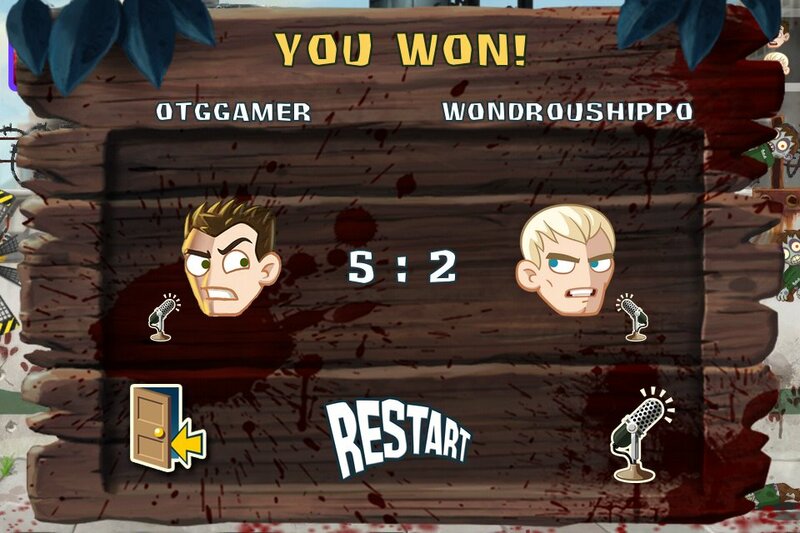 Head To Head Multiplayer Is Coming to Gamedoctors’ ZombieSmash! Gamedoctors, are scheduled to roll out an update to ZombieSmash! this Thursday (for both the iPad and iPhone releases), which will add head to head multiplayer action via Game Center. I had an opportunity to get a early hands-on look at the new multiplayer experience with Carter Dotson (senior writer for 148Apps and the voice of The Portable Podcast). We played the new mode on a number of occasions, the first of which I am happy to say I DOMINATED (the next…well…not so much). As I already mentioned, ZombieSmash! multiplayer matches are head to head. Setting up a battle is super simple, just navigate to the new ‘-VS-Battle’ campaign and you are prompted (via the standard Game Center matchmaking dialogs) to select one of your Game Center friends to challenge or you can play against a random player. My matches against Carter connected quickly and in a matter of seconds we were ready to see who would flick supreme. Each player is assigned an avatar and must tap “Ready”, then the action begins. The multiplayer plays pretty much exactly like the single player version of the game. 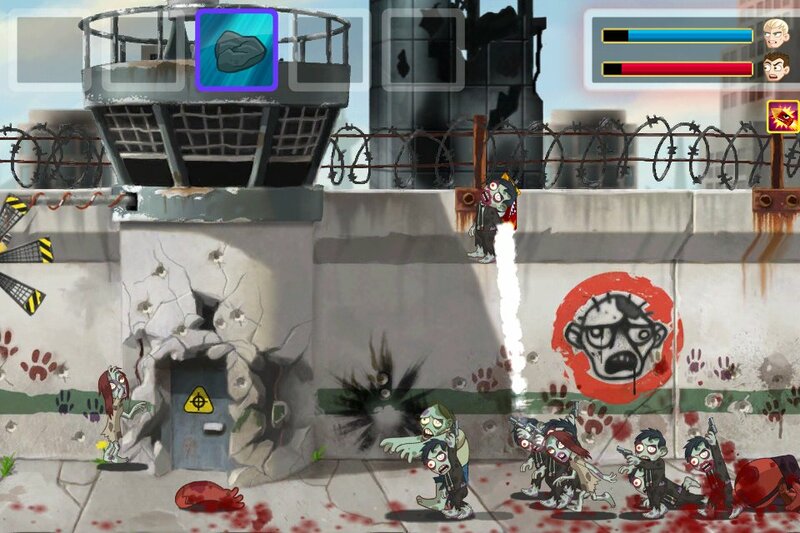 Each player sees their own area to defend against hoards of attacking zombies, and must get their flick on to defend the base as long as possible. At first glance it really looks no different than your standard single player game of ZombieSmash! aside from the fact that you see two life bars in the top right corner of the screen. While you are playing, the random special power ups (both defensive and now offensive) will periodically appear on your screen and you will need to decide when they are most advantageous to use. For those of you unfamiliar with ZombieSmash!, there are two sizes of Zombies, big and little. The little zombies, while quicker and greater in number, do less damage and can be easily flicked away. The larger zombies move slower, but do more damage and can only be killed via one of the game’s many crazy special weapons. In addition to the standard single-player power-ups, in multiplayer mode, you’ll also see circle medallions appear (with zombie faces on them). 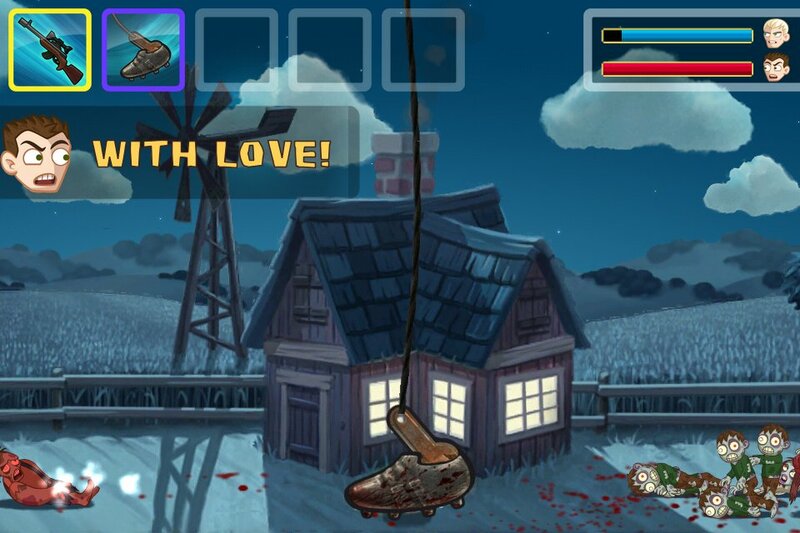 Capturing and using these offensive specials will cause a big red zombie to start moving in on your opponent’s screen. If you get several of these offensive specials you can save them up for a larger attack, or send them as you get them for a constant offensive. Since the big zombies cannot be simply flicked away, you must use your power-ups sparingly so you have them ready when your opponent wages a strong zombie attack on you. This means that your odds of winning are not based solely on dumb luck, there is some skill and tactics involved. In fact, while the special spawning is random, both players get the exact same amount of specials (but not the same type of specials) and both players get identical waves of zombies. I particularly liked this, because it is a truer measure of who is the better strategical player. Because you’ll never know if you are going to get offensive or defensive specials (or which ones) every match is different and will require different skills and tactics. In my experience, there were a few instances of long stretches where no specials appeared, but as Gamedoctors’ Thomas Hoechsmann put it, “if there is a longer period without specials and more strong zombies, the other player will face the same problem”. I still feel that a little more tweaking would be nice here to increase the specials rate a tiny bit and the guys at Gamedoctors said that this is definitely something they will be monitoring and tweaking as necessary. One of the big surprises and highlights of the new multiplayer mode was its integration of Game Center’s often overlooked voice chat feature. Carter and I were able to talk trash and discuss the game while playing and the voice chat REALLY added to my enjoyment of the multiplayer experience. It worked flawlessly and sounded crystal clear through my stock Apple earbuds (w/ mike). Without this feature, I think the multiplayer experience would have a much more sterile and solitary feel, so I highly recommend checking this out, otherwise your interaction with your opponent is a bit limited. That being said, each time you send a strong zombie to the other player, there are these little popups with the other player’s avatar saying funny stuff, so even if you don’t take advantage of the voice chat there are some other cues to help keep the multiplayer ambiance. As it stands right now, online matches continue for as long as either player wants them to, with a running tally of the players’ match wins. The guys at Gamedoctors wanted to keep the match setup process as quick and painless as possible, with little to no options that had to be set or tweaked beforehand. I suggested that they add an option for playing “best of x matches” after which a definitive winner is declared, with an option for a rematch. They seemed to like this idea, so hopefully we’ll see something like this in a later iteration of the multiplayer mode. Carter and I did experience a few random appearances of what I’ve dubbed the “Ready, Ready” screen mid-match, where we had to each tap “Ready” to get back into the current match. I think this is possibly related to notification popups, and making sure that the players stay in sync. It didn’t really effect the gameplay, but it did kill the momentum a little. Otherwise all of our matches played flawlessly with no noticeable lag. Overall, the multiplayer mode certainly adds a fun new twist to the traditional ZombieSmash! gameplay. Fans of the game will definitely enjoy this new mode and since Gamedoctors plans on tweaking and adding more multiplayer specials to extend your ability to interact with your opponent, I only see this mode getting better and better going forward. 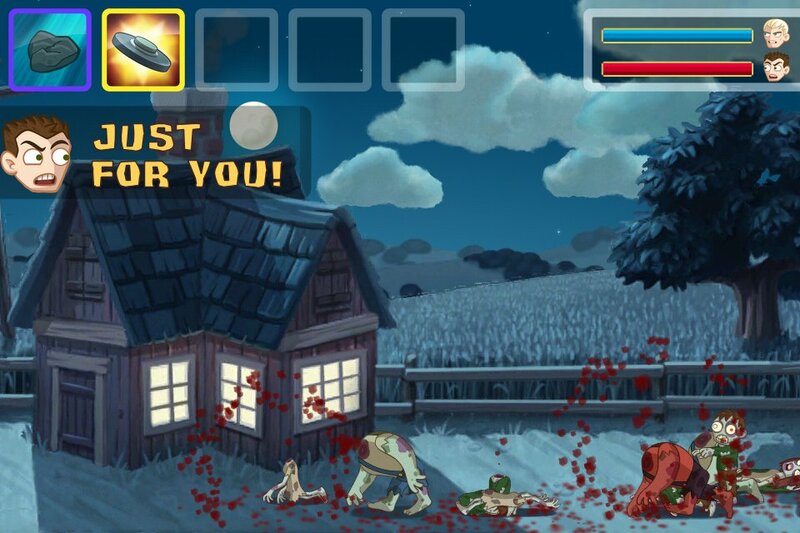 The iPhone release of ZombieSmash! is currently on sale of 99¢ (50% off) and the iPad release is $1.99 ($1 off).